Most people especially some youth has found it difficult to access internet as they used to do and that is why we at Howtosguide have make a research on how you can Get Free Airtime Daily For Data And Calls On All Networks. follow the steps below to be eligible for the free airtime with the help of Opera News mobile application. This free airtime, can be used for data subscription and calls to any other networks of your choice both local and international. 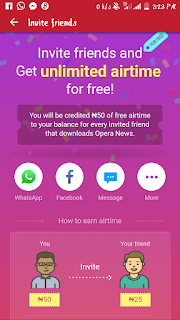 Opera News now gives free N25 airtime when you download the app and when you refer, you get N50 airtime while your friend gets N25. Isn’t that cool enough? Imagine yourself being able to refer 10 people, lets do the calculation: 10people x N50=N500 airtime which you can use for call or data. refer people using the referrals code given to you in the application’s dashboard. i jst tried to download this opera mobile bur it just showing a blanked coloured and white page.